Like Rob_STI_PNW said, it's all about what you want. Most people are after dyno numbers. The Red will get you that. Some of us are a little weird and different, and dyno numbers are only a result of how we want our cars to drive. So, don't be discouraged! Personally, I like my car responsive, quick, and "right now". I'm definitely in the minority. I never recommend people go my route because it's kinda unpopular. You should see people's reactions when they get in my car, though. It's hilarious They can't believe my WHP numbers and that my car is mostly stock. LOL. Freeway pull are pretty boring, though. I run IDC 1300 injectors on my HTA 71 E85 set up based on CBRD's recommendation. It was okay. I had noticeable lag compared to the 71. Definitely not as fun/spirited. I had more fun with the 71. Slight difference in spool up but I wouldn't call the MHI red/green a laggy turbocharger. Transient response is pretty close between the 4 turbo's. The engine can only move so much air at a lower speed , you can experience compressor surge if it can't process the air going into it from too small of a turbo/high boost. Most people are on the stock block so you have to stay under 400ft lbs of torque. On a mivec car on E85 the stock turbo/hta 71 can make enough boost to exceed 400ft lbs by 3400/3500 . The MHI green is 3600, and the red is 3800. With the stock engine going well to 8000 that leaves a broad power band with the red. The MHI red is snappy enough to powerslide the car in second gear . Even with a taller 4.11 final drive. I think its perfectly acceptable for a street car. Its not so on/off and jerky like the stock turbo so it drives better IMO. If you look at dyno charts between most of the turbo's you will see the torque come up and then go down. Having a turbo like the red means the power comes up well enough for the engine to consume the air, then carry the torque well until redline. I'm not saying the MHI red is the best thing since sliced bread but it checks alot of boxes for the road course, street and drag. In my experience It will make 420-430whp on pump 93 around 23-24psi. 500whp on ethanol at 28-30psi, 600whp + at 35+ on a 2.0. 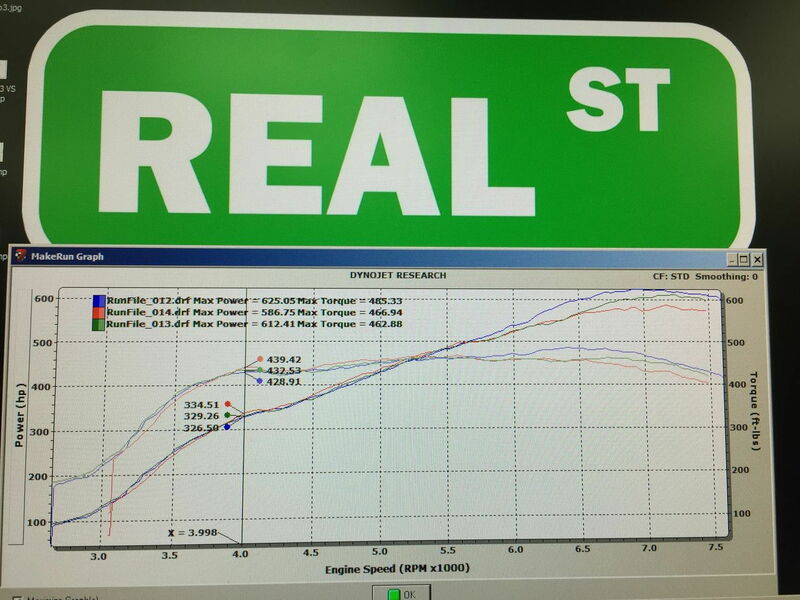 This was with stock cams and a 2.75" downpipe. Its important to set your goals for your car. If its an autox car then an HTA 71 or stock turbo is the best route since it comes on the quickest. The SS green or red is a nice setup if you want to make power easier and don't mind more lag. Everyone has a preference or goal in mind. A dyno only tells half the story but still a good indicator . 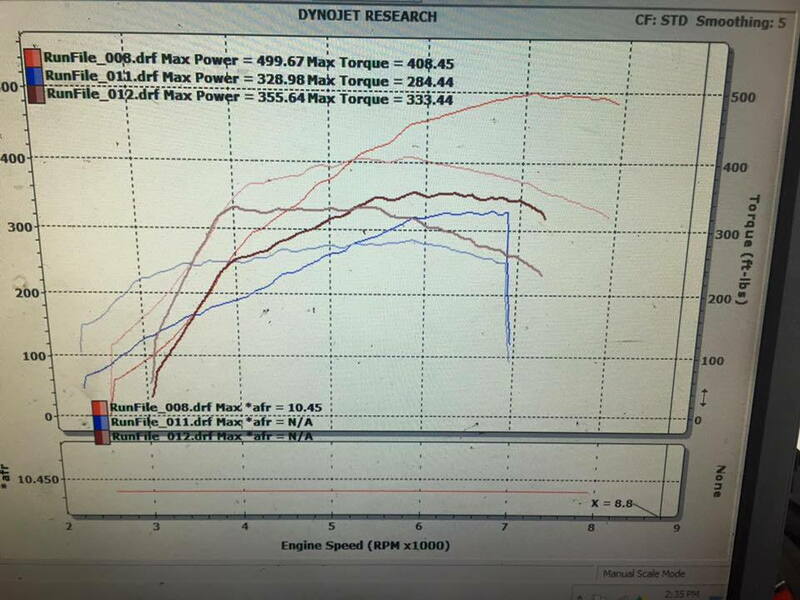 Here is an old dyno graph of the stock turbo on pump gas before and after some tuning. Then the red on ethanol. Notice how it follows the same line on the way up. This was back in the stock ecu days so its far from optimized . It will make 400ft lbs at 3800-4000 if you want it to on ethanol. 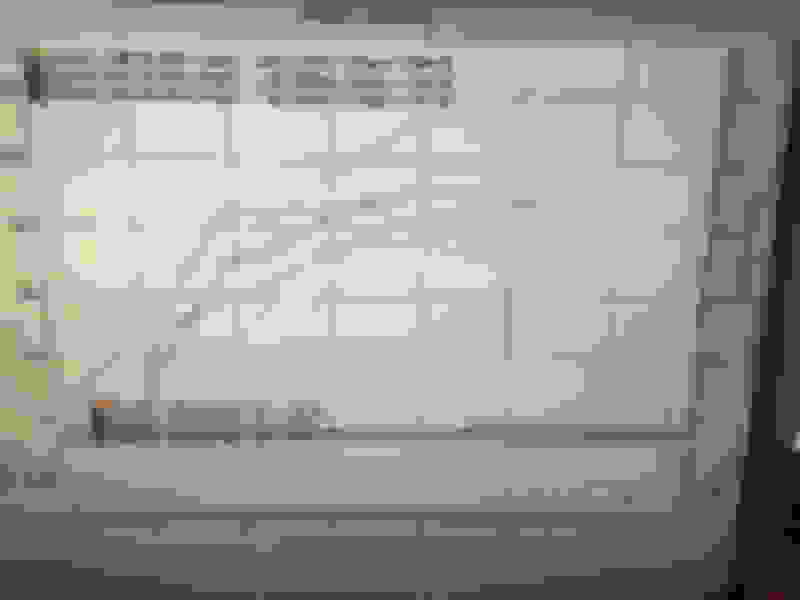 I'll also include the 2.2 graph so you can see what the turbo can really do. The lower graph was medium effort and boost. The red can exceed 500lb ft if you have a built engine. Last edited by Abacus; Aug 20, 2018 at 04:50 PM. It's all relative, subjective, and opinion. I didn't like how the Green made the car feel, compared to the 71. I noticed the lag, especially around town and the occasional autox. For track days, it was fine. I just want to have a bit more fun off the track, even if it affects lap times a bit. I think I mentioned using bigger turbos on stock blocks. I also think I said we're unable to take advantage of the extra torque from a Green/etc, so we end up with all the lag and none of the benefit. I'm on the mobile, app, so can't see my other posts, that's why I'm saying "I think" Anyway, I obviously agree with ya on all that. You are correct, In the end its what we want to do with our cars. There is a clear benefit, its a larger powerband! Look back at the graph I posted, not just the numbers. Its just important to note that a green/red will spool up near stock, and carry the power through out the band. With proper boost control and tuning you can have a pretty fast car that drives near stock. It will also have lower EGT's and backpressure compared to the 71/stock. If you had enough injector you could respect the 400ft lb limit and still make over 600whp. Ethanol is always a good thing. Its not going to drastically change spool up but will add alot of power and knock protection. It comes down to what you want the end result to be with your build. We are all spoiled by technology, fuel and turbochargers these days. Just have to chose your path. I run e85 at the track due to how cool it burns. I can push a smaller turbo harder without too much concern. I think if I were still using pump gas, I'd have to use a larger turbo than I'd like, for safety sake. Compared to the 91oct we have in CA, that is. The cars are definitely, DEFINITELY peppier on e85, due to all that extra timing. I'm a fan. Stock cams made that? Can you share other supporting mods you had? I'd go back to Honda ,if I wanted a peaky power band. With enough fuel/tuning the SS housing will go well to 8000 or so.